The Catholic University of America will hold its Sacred Music Colloquium this year from June 19 to 24, titled "Six Days of Musical Heaven." The Colloquium will include daily Mass in the newly restored Basilica of the National Shrine of the Immaculate Conception. It is sponsored by the Church Music Association of America and the Center for Ward Method Studies of the Benjamin T. Rome School of Music, Catholic University. The Musica Sacra information page about the Colloquium says that it will provide extensive training in Gregorian chant and Renaissance music with a world class faculty; choral experience with a large choir singing the works of such masters as Josquin des Pres, Byrd, Tallis, and others; and daily liturgies in the Crypt Church of the National Shrine. Overlapping the Colloquium in time, Ave Maria University will again offer its Advanced Gregorian Chant Study Week in Solesmes from June 18 to 22 at the Abbey of St. Pierre in Solesmes, France. The Advanced Study Week will include classes 2 or 3 times a day from Dom Daniel Saulnier, O.S.B., of Solesmes, who is the Director of Paleography at the Abbey and professor at the Pontifical Institute of Sacred Music in Rome. The daily offices are chanted by the monks of Solesmes in their beautiful abbey chapel. Most of the photos here in the sidebar were taken in the parish church, which is just outside the wall of the abbey. Photography is not allowed inside the abbey chapel. There are photos of the abbey chapel, as well as books and recordings for sale online, on the abbey website. 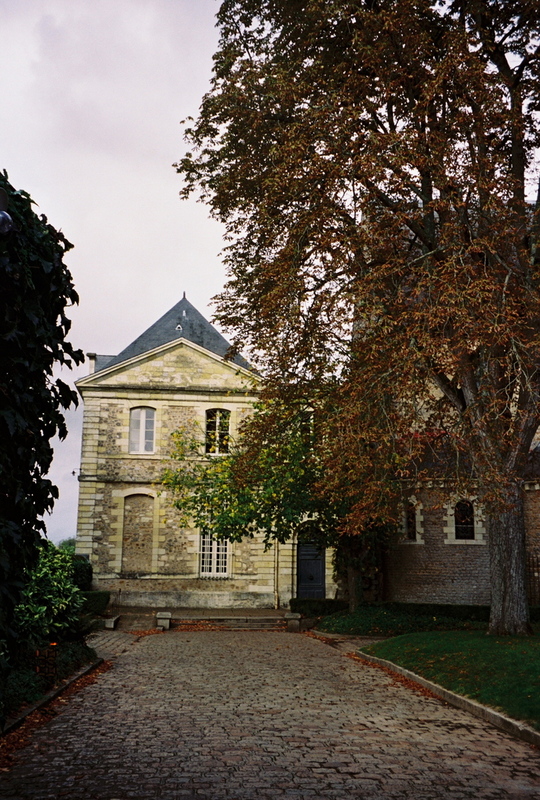 Picture: Entry courtyard of the Abbey of St. Pierre, Solesmes, October 2005. Dom André Mocquereau's "The Art of Gregorian Chant"
Musica Sacra (from the Church Music Association of America) has added to its collection of articles and resources an English translation of the paper "The Art of Gregorian Chant" by Dom André Mocquereau, O.S.B., of Solesmes. The lecture was originally read at the Catholic University of Paris in 1896. It is a classic paper on the subject The English translation was originally published in the Catholic Education Press. Pray for the French Bishops' Conference now in progress at Lourdes and the U.S. College of Catholic Bishops' conference which will begin on November 13 in Baltimore. Both have questions of liturgy to discuss, including the anticipated Motu Proprio that is expected to expand the use of the Latin Tridentine Mass, a particular concern in France because of the possibility of bringing more of SSPX into the Catholic Church. "New Catholic" at Rorate Caeli has an English translation of part of Cardinal Ricard's Opening Address in Lourdes on Saturday, mentioning the anticipated Motu Proprio. Vatican Radio yesterday had a short audio interview with Cardinal Arinze about Latin in the liturgy. In the short piece, he mentioned his recent trip to France and a day he spent at the Abbey of St. Pierre in Solesmes, where the daily offices are chanted in Latin. Related posts on this blog include English translations of Cardinal Arinze's address on the liturgy, recently given in Paris, and an earlier Zenit interview with Fr. Jacques-Marie Guilmard of Solesmes on the history of Gregorian chant. Also see the gallery of photos from Solesmes in the sidebar. The Church Music Association of America has assembled a downloadable PowerPoint Tutorial_in_gregorian_chant. Meanwhile, a workshop in Gregorian Chant is planned for the week-end of October 20-21 in Reno, Nevada. I have added it to the Blog Calendar here (see the sidebar). The workshop will be led by Prof. William Mahrt, professor of historical musicology and Medieval and Renaissance music at Stanford University, who is the president of the Church Music Association of America. There is more information and a downloadable brochure here. Both items from Musica Sacra. Patrick Russill is the Oratory's director of music. John McGreal is the organist whose work is featured. You might notice some features of Anglican church music, especially if you are accustomed to the monastic chant recordings from continental Europe. Two Interviews on Music: "A Liturgy that Gives Music Its Proper Place"
"The great repertoire of sacred music that has been handed down to us from the past is made up of Masses, offertories, responsories: formerly there was no such thing as a liturgy without music. Today there is no place for this repertoire in the new liturgy, which is a discordant commotion – and it’s useless to pretend that it’s not. It is as if Michelangelo had been asked to paint the general judgment on a postage stamp!" So said Maestro Domenico Bartolucci in an interview with the expert in classical music for the weekly "L'espresso", Ricardo Lenzi, and posted today by Sandro Magister. Maestro Bartolucci is outspoken in his analysis of the changes in church music over the last several decades and about the difficulty of restoring music to its proper place in the liturgy today. Meanwhile, I just became aware this past Sunday of an interview on French language Zenit with Père Jacques-Marie Guilmard of the Abbey of St. Pierre in Solesmes, France, about the origins of Gregorian chant. The interview posted while the Pope was in Poland, and I could not find it in English. Perhaps it was overlooked because of more immediately important articles about the Pope's travels in Poland. I have e-mailed Zenit asking for permission to translate and post the whole article, if they do not plan to translate it, and I have not yet received a response. Update July 24: I have received Zenit's permission to post an English translation of the interview, and I will translate and post it this week-end if not sooner (by July 30). Meanwhile, here is a link to the interview with Père Guilmard in French. With several posts on this blog about Gregorian chant (see "Music" in the sidebar) and photos from the Benedictine abbey in Solesmes, France devoted to the study and preservation of Gregorian chant (scroll down in the sidebar), I thought it would be interesting to add a post about the two American monasteries that are members of the Congregation of Solesmes. One is a house for monks in Oklahoma with a beautiful monastery building at the architectural stage, and the other is a house for nuns living lives of contemplative prayer in Vermont. Both have their own websites. The newer monastery of the two is Clear Creek Monastery in Oklahoma. Clear Creek's buildings are still mostly in the planning stage. While the monks make do with a barn and a scenic log farmhouse, they have beautiful photographs of their monastery and renderings of their recent construction project on the banks of an Oklahoma creek. The monastery's full name is Our Lady of the Annunciation Monastery of Clear Creek. Oklahoma might seem an odd place for a member of the French Congregation of Solesmes, although there is one other U.S. monastery among the 21 monasteries of the Congregation. Clear Creek is a foundation of a French monastery (Fontgombault) which was in turn founded by St. Pierre de Solesmes, devoted to the study of Gregorian Chant. Moreover, as the abbey at Solesmes traces its founding back nearly 1000 years, with an even older adjacent parish church, the Father Abbot of Fontgombault told Clear Creek's architect, "We want a monastery to last 1000 years." The Clear Creek website has a page of its gregorian chant CD's available for purchase. Visitors are welcome, and information about visits to Clear Creek are also available on the website. There is also a page on how to help with the construction and an address where you can sign up for the monastery's mailing list. The other American monastery in the Congregation of Solesmes is the Monastery of the Immaculate Heart of Mary in Westfield, Vermont. Westfield is a monastery of Benedictine nuns founded in 1981 by a French Canadian monastery. The Westfield site has a page about St. Benedict and the Rule and another page about their Benedictine life of contemplative prayer, silence and solitude, in the mountains of Vermont. The nuns support themselves by the sale of altar bread, and of course you can e-mail them for ordering information.